Facilitate preclinical and basic science research with advanced micro-scale & nano-scale imaging. Established in 1989, the Johns Hopkins University School of Medicine Microscope Facility has provided light, fluorescence and electron microscopy services to over 400 users a year throughout Johns Hopkins University and the local area. 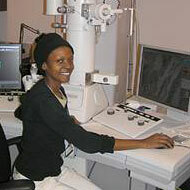 We are one of the largest and most popular facilities in Baltimore providing microscopy and imaging services. As a fee-for-service core facility, we are partially supported by the Institute for Basic Biomedical Sciences, a coalition of the Basic Science Departments, Department of Cell Biology, and the School of Medicine. Our imaging resources have facilitated numerous publications and grant proposals for our users throughout the local research community. Our mission is to facilitate preclinical and basic science research. We are constantly purchasing or building new equipment, so all of our instrumentation and software are state-of-the-art. Just in the last three years, we've added >$2M of new equipment. We can assist you in your microscopy or we can train users to operate microscopes themselves. We are proud of our high-quality specimen preparation and the corresponding high quality of images that we provide. Read FAQ to see the ways that we can help you with microscopy. Part of our mission is to train and educate users so that they can best use the services and equipment we provide. In addition to specific instrument training, we offer elective courses for credit, as well as individual workshops that highlight technologies or tools. Because each research question is different, we are eager to help you meet those challenges by designing experimental procedures or developing custom hardware, software or specimen protocols. Let's solve the problem and get the answers together! Call or for help with your research needs.